I was a little girl living in Florence when category 5, Hurricane Hugo hit South Carolina. I remember the tree that fell on my neighbor’s house. Downed trees and power lines. Tree frogs clinging to our screen door in the rushing wind. Being stuck in the dark for days after the storm hit. And news footage of homes along the coast than had been leveled. But I’d never seen a natural disaster wash away the earth like it was nothing. I’d never seen water constrict large structures until the windows shatter under the pressure. I had never seen so many roads collapse at once–at least not before last Sunday. Not in Columbia. My mom and I stop by the Whole Foods at Devine and Garners Ferry to pick up a few groceries. It’s football season, which means Chris is out watching a game tonight, which translates into me not cooking. Yes! It’s raining. Still. It’s been raining all week. I don’t mind–I love the rain, and it’s been a hot summer. I stop by the smoothie counter before picking up some soup to knock off the chill from the smoothie and the rain. The man blending my drink asks me if the weather has gotten bad outside yet. I didn’t know it was supposed to get all that much worse. The governor declared a state of emergency earlier in the week. State of emergency? Like emergencies we face when we get a pathetic excuse we like to call a snow storm? I think we’ll survive. And I keep our pantry pretty well stocked, anyhow. Chris wakes me up to let me know church has been cancelled. Cancelled? That sounds excessive. But I’m relieved. I have a job to do, and I’m not well rested for it. I’m going back to sleep. Then he tells me a family member’s back yard has flooded. The waters are rising up the steps, but they have moved to safety. Then he tells me about an email from friends who were knee-deep in water at home before relocating to a family member’s home. And I hear the local news on T.V. Not going back to sleep after all. I check Twitter. I see pictures of a portable toilet and a large dumpster washing down Rosewood and Garners Ferry. I was just there last night. I start paying attention to the news. A section of Two Notch is under water. Neighborhoods along the Gills Creek Watershed are under water. The Old Mill in Lexington is under water. I’ve spent a lot of time in that mill. A section of I-20 is under water! And people are driving into this mess. Why would you ever drive into anything you can’t find the bottom of? The water is crushing the Title Max on Garners Ferry. I don’t think I fully understood how something so quiet could be so destructive before this point. Sidewalks and healthy-looking roadways are disintegrating as the flood washes them away. A section of sidewalk along Beltline Blvd. crumbles after floodwaters wash it away. SCE&G is releasing water from the Lake Murray Dam. I’m a little concerned about the integrity of the dam, since the engineers see the need to do this. Every time I go outside I hear a siren. And rain. Always more rain. Living this close to the city and several fire stations and hospitals, we hear sirens all the time. 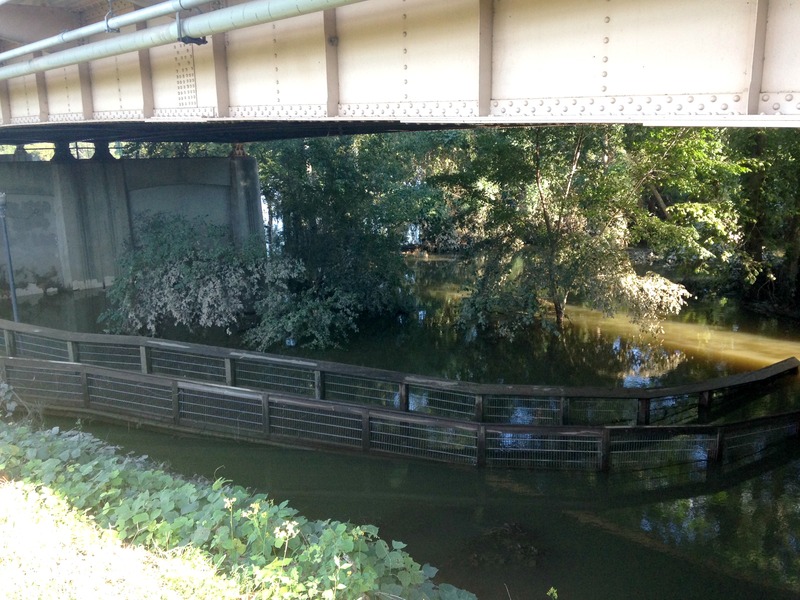 The water level recedes from under the Blossom St. bridge. SCE&G released water from the Lake Murray Dam on Sunday, causing river levels to rise. These sirens are different. More desperate. More frequent. From the look of our neighborhood, you’d never guess that conditions are dire a few short miles away. Disbelief is making way for sadness. Places I love have been devastated. Statewide, neighbors have lost everything. Still the rain comes. And the sirens. These poor people aren’t catching a break. 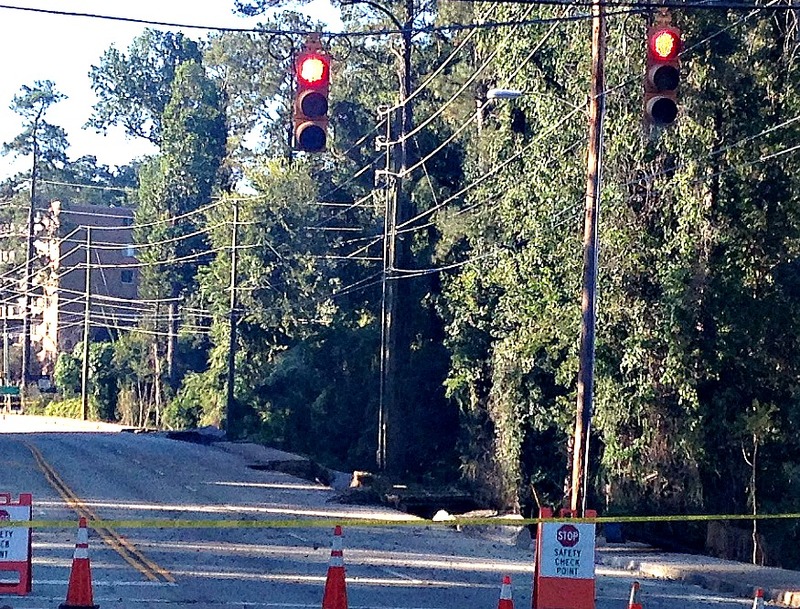 Officials are evacuating the Forest Acres area. Sweet friends call and text to make sure we’re okay. They’re generous to others, too–sharing any resources they have with others who lost power, water and property in the flood. Businesses in the area are giving away water to flood victims who are without clean drinking water. Otherwise, the scene reads like a Samuel Taylor Coleridge poem. I wonder what the damage to our roadways is going to cost our state. We venture out Monday night. I crashed for most of the evening. And I’m not making bacon, which is the only thing we have thawed for dinner. We’re probably breaking some kind of curfew. But the main roads are clear–free from flooding and barricades. I don’t feel well, and I’m not cooking. It’s late. The grocery store, the drug store, a gas station and a McDonald’s are all closed. I settle on tuna, and Chris makes pasta with some pre-cooked frozen ground beef for himself. I shouldn’t be so fussy. Some people’s pantries have been washed away.